Covered or open? Choose your own adventure. Look for lounge areas throughout the resort. Play all 18-holes of Greg Norman-designed perfection next door at the Ritz-Carlton Golf Club. Duck inside with your e-reader when you need a break from the sun. Hit it hard. The equipment can handle it. Early risers can slip outside without waking the whole gang. This resort offers a children's activity program. Access to championship golf course at Ritz Carlton's golf club. Relax along the lazy river. The waterslides are great for kids and adults of all ages. Ideally situated on five-hundred acres of lush tropical greenery, Marriott’s Lakeshore Reserve is part of Orlando’s popular Grand Lakes resort and offers a tranquil counterpoint to the theme park sensory overload. Your semi-pro splashers will walk-run toward the outdoor zero-entry pool every morning. Race them down the two waterslides (winner gets an extra juice box) or hang out in the lazy river. Grab a few loungers under the palms or splurge on a cabana for the day. Order lunch and a refreshing drink from the poolside bar & grill. Ready to get your cardio on? Drop the kids off in one of the two children’s activity centers and get in a workout at the fitness center. On your way back to the condo, stop for a just-because ice cream or midday Starbucks from The Marketplace. Modern one- and two-bedroom vacation villas give you plenty of space if you need a break from the incessant beeps of kids’ games on the tablet. Full kitchens allow you to make your own meals and save money for important things- like theme park tickets, Mickey hats and matching t-shirts for the family. Pack light thanks to your washer/dryer and do a load or two during your trip. And later on, watch how the sound of popcorn popping rounds everyone up in front of the flatscreen TV with DVD player faster than you can say “movie night.” Good news! The resort offers free DVD rentals. You’ll also have CNN, ESPN, and HBO if you catch up on the news, watch the big game or see the latest episode of Game of Thrones. SeaWorld® features rides, shows, and animal attractions. Rides include Kraken Unleashed, the floorless virtual-reality rollercoaster, the kid-friendly Shamu’s Happy Harbor and Manta. See Clyde and Seamore in Sea Lions Tonite, cats and dogs in Pets Ahoy and be sure to stick around for the nightly fireworks show, Ignite. Animal experiences include dolphins and five different species of penguins. 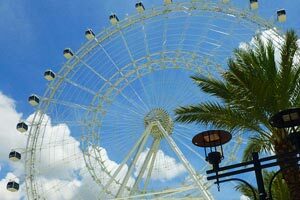 Universal Orlando® is made up of two theme parks. Visit Universal Studios® to ride through E.T., Shrek, the Terminator and The Mummy. Fans of Harry Potter will definitely want to check out The Wizarding World of Harry Potter®, located over both theme parks. Diagon Alley is at Universal Studios®, and Hogsmeade is in Universal’s Islands of Adventure®. Islands of Adventure is where you can ride through Jurassic Park, Spider-Man, the Hulk and King Kong. Disney Springs is Walt Disney World’s® shopping and dining destination. World of Disney® is the place to go for stuffed animals, apparel, Mickey hats and other Disney souvenirs. Grab a new pair of shades at Sunglass Icon. If there are any left-handers in your group, make sure that they check out Lefty’s the Left-Hand Store. Your little princess will love getting a fun makeover at the Bibbidi Bobbidi Boutique. Get your caffeine fix at Starbucks; there are two locations in Disney Springs. Hungry? Rainforest Cafe, Blaze Fast Fire’d Pizza and House of Blues are just a few of your many options.